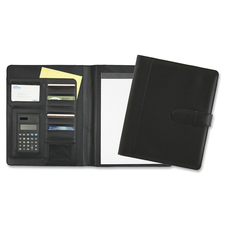 Features 2 document pockets.Zippered closure.Includes writing pad.1" rings.Letter size.Koskin. Features 1 zippered, interior pocket and an exterior document pocket.Zippered closure.Includes writing pad.1" rings.Letter size.Leather. Features 1 zippered interior pocket and 2 exterior pockets.Zippered closure.Includes writing pad.2" rings.Letter size.Koskin.